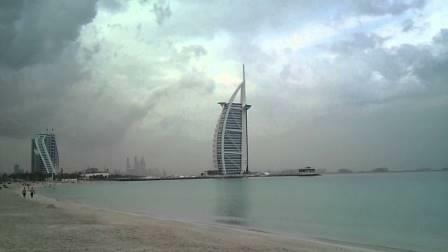 Dubai: Cloudy weather with a chance of rain is forecast on Saturday, a day after grey skies and scattered showers made for a wet day for motorists across the country on Friday. Temperatures hovered in the high 20s for the most part across all emirates with the lowest temperature recorded was 12.2 degree Celsius in Jebel Jais, Ras Al Khaimah, at 7am. “Different intensities of rain fell over scattered areas of the country,” according to the National Centre of Meteorology. Weather is expected to be a bit gloomy with more clouds and isolated rainfall expected in the next few days. On Saturday, the weather will be “partly cloudy … with a chance of rain over the northern and eastern areas during morning with a drop in temperature”, forecasters predicted. Moderate to fresh winds especially over the sea and exposed areas will kick up dust at times. A look ahead suggests “the relative humidity is likely to increase over some internal northern and eastern areas with a chance of fog and mist formation”, said forecasters. For Sunday and beyond, the national weather bureau expects partly cloudy and hazy conditions to continue across the country. Winds are expected to be moderate reaching to more than 40km/h on Sunday bringing more dust in open areas of the country at times. The humidity is also expected to increase, said the weather centre. Motorists are reminded to drive cautiously as winds and dust can reduce visibility on roadways.